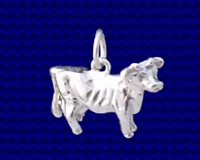 Sterling silver Jersey cow charm. Jersey cows were originally bred on the island of Jersey in the British channel Island. Jersey cows are known for being placid and for producing milk with a high buttermilk content.They are a small breed of cow but are also known for the ease with which they calve. The Jersey cow has a brown colour in any shade from light tan to dark brown.